Join Ron, Meenakshi, and the renown Sudhir Tiwari, for a long weekend outside of Toronto at a beautiful retreat centre. Filled with guided pranayama sessions, asana, lectures and a kirtan, we will enjoy a community rich weekend filled with laughter, great food, deepening our internal practice, and swimming in the surrounding lake! Workshoping backbends, twists , deep hip openers and Arm balances! Sun, Swim, Surf and Spa! 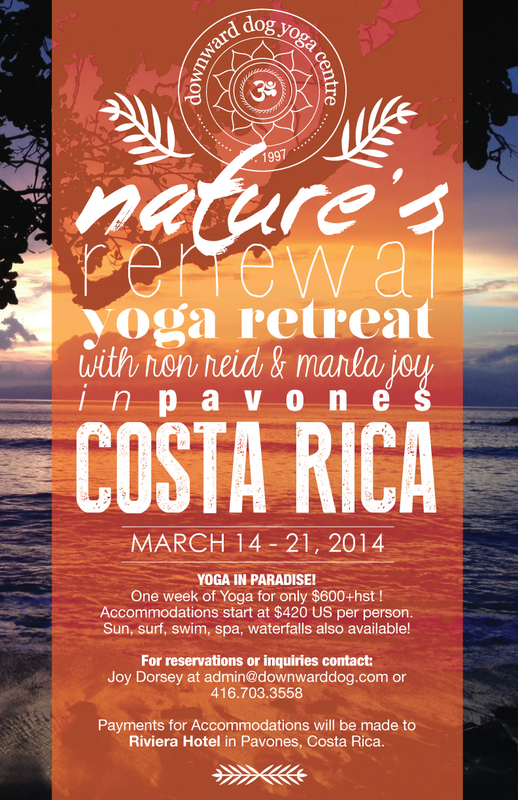 Witness nature at its most spectacular, practicing amidst the unparalleled flora and fauna of breathtaking Pavones, Costa Rica! TWO RETREATS IN THAILAND, KOH SAMUI! FIRST WEEK: "Deepening your practice: Finding balance in Surya and Chandra Nadi's"
SECOND WEEK: "Bringing Art and Soul into the practice of Ashtanga Yoga"
YOGA RETREAT AT KRETASHALA, CRETE, GREECE! We are please to be returning to Yoga Thailand once again! VISIT: www.radiantlyalive.com/training.php and scroll down for more information! "The Art and Soul of Ashtanga Vinyasa Yoga"
Please join us for an invigorating week on the beautiful island of Crete, in Greece. This is a totally unique opportunity to study with these deeply experienced and inspirational teachers. They offer a blend of ashtanga yoga, philosophy, mantra study and practice, kirtan, pranayama, restorative yoga and meditation…infused with the intention to see Yoga as a Spiritual art form. As we awaken new areas in our physical beings, we nurture the expression of the soul and raise it’s vibration to a higher level. VISIT: www.yoga-thailand.com for more details and to register. Come and join us for this fantastic week in the midst of Italy’s green heart…Umbria! Halfway between Rome and Florence, amidst beautiful vineyards and a beautiful old convent where San Francesco of Asissi used to live, is LA CASELLA, a beautiful classical farmhouse right in the middle of the Etruscan valley. With acres of land, horseback riding, a mini spa with 2 saunas, Jacuzzi, and a beautiful new yoga room with heated floors, LA CASELLA is the perfect place for yoga, rest and rejuvenation.